Troax offers adaptive protective panels for factories. The posts have different component options to fit any kind of metal mesh, sheeting or polycarbonate panels. You can create the perfect arrangement for any cage to fit in many kinds of areas. Per the Machinery Directive, the system is required to disassemble without damaging it. These panels are 7' 2.6" and 4' 7.1" with a 5.9" floor gap for easy cleaning access. The panels are available in 7 different widths, from 7.9" up to 4' 11.1". Both can be customized to any dimension. Troax keeps it in stock for immediate delivery for your convenience. For difficult to fit areas and unprotected environments, the Strong Fix panels are recommended. The Strong Fix panels have sturdy components and heavy duty posts of 3.1" x 3.1", these panels can withstand strong impacts. 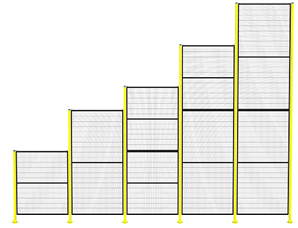 The ST30 mesh panels have been proven to endure impacts up to 1,475 foot-pound force. These cages can be used to protect machines and robots. These panels meet the requirements of the Machinery Directive, 2006/42/EC code. When completing machine maintenance, Rapid Fix advanced method uses easy to remove supports letting these panels detach very easily. This fix will grant convenient entrance to the device cage for faster maintenance. The structure mesh panels have been proven to endure impacts up to 737.6 foot-pound force. These panels are compatible with the Smart Fix product system. It can be used for device cells. These panels meet the requirements of the Machinery Directive, 2006/42/EC code. The Smart Fix is made of threated brackets and mesh panels which can withstand impacts up to 1,180 foot-pound force. This fix is mainly used for uneven floors because in can be easily adjusted. It is also easy to assemble. The Troax machine guarding Smart Fix system is compatible with other Troax systems. Customers commonly use this product for automated production. These panels meet the requirements of the Machinery Directive, 2006/42/EC code. The Combi Fix system has lower and threaded brackets. The system uses a combination of Troax’s Rapid Fix and Smart Fix creating a strong but also a flexible system that is easy to take apart for machine maintenance. These adaptable panels adjust to different heights and slopped floors. These panels meet the requirements of the Machinery Directive, 2006/42/EC code. The High Line steel machine guard is designed for areas with high security and hygienic standards. These open and fully-welded horizontal panels’ surfaces are made for easy cleaning, even when placed directly on the floor. Stainless Steel commonly used for pharmaceutical and food applications. Unframed mesh is also available. These panels meet the requirements of the Machinery Directive, 2006/42/EC code.